Former Newcastle goalkeeper Pavel Srnicek had a "stable night" in hospital following his cardiac arrest, his agent Steve Wraith said. Czech Srnicek, 47, who also had spells with Sheffield Wednesday, Portsmouth and West Ham, collapsed while out jogging in Ostrava on Sunday. It is hoped he will have a CT scan on Wednesday. "His body is healing. However, there is a long, long way to go," Wraith said. "Wednesday is an important day." The agent added: "If they can perform the CT scan, we should know a lot more about his chances." Srnicek became a fans' favourite during his first spell with the Magpies between 1991 and 1998. He was signed by manager Jim Smith and played under Ossie Ardiles, Kevin Keegan and latterly Kenny Dalglish. 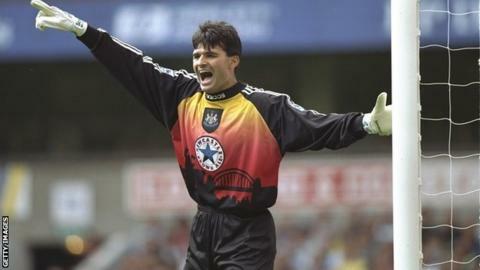 While Keegan was in charge, Srnicek helped Newcastle win promotion to the top flight during the 1992-93 season. The former Czech Republic goalkeeper was also an integral part of the squad that came close to winning the Premier League title in the 1995-96 campaign. Srnicek was brought back to the club on a season-long deal in September 2006 as cover for the injured Shay Given. He made 49 appearances for his country and was in Tyneside in December to promote his autobiography.